When it comes to traveling, you may not always want to leave your pets at home. If you are visiting the vets for example, you will benefit from having a quality pet carrier to improve your pet’s journey to their most hated place. Similarly, if you are going on a weekend vacation, you may want to take your little friend with you. If you haven’t purchased a pet carrier before, then you may not know where to start and what to look for. If this sounds like you, continue reading because we’re going to discuss 3 of the best pet carriers on the market today which are guaranteed to give your pet a more comfortable journey wherever your destination may be. Amazon Basics offers a very nice cat carrier which is perfect for your furry friend when you need to take them with you. This carrier is made with machine-washable fleece and is perfect for everyday use. We will take a look at this carrier’s key features below. Amazon Basics has created a quality pet carrier which is perfect for your cat. This pet carrier features a reliable design and is comfortable, providing adequate airflow for your little one when in transit. 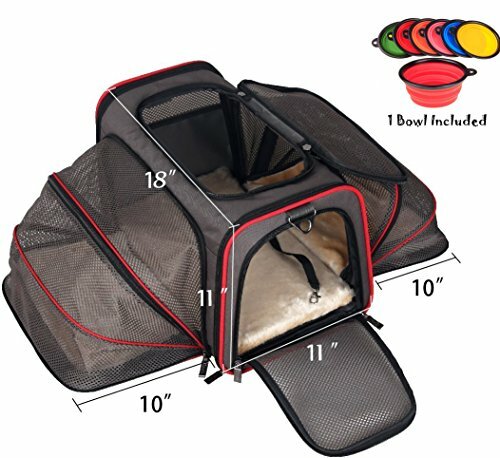 The design of this pet carrier is one which your cat will love with its mesh ventilation on four sides of the carrier. This makes it perfect for your pet to breathe, and look out of when in transit, and at the same time allows you to check on them to make sure they are ok. The carrier features a removable base insert which allows your pet to stand up as well as a removable fleece pet bed. Sometimes you will need a little room when carrying your pet, and with this carrier it is possible thanks to its adjustable straps. This allows you to adjust the strap to your individual body shape, making it all the more comfortable to carry. The best extra feature of this carrier is the fact it is backed by AmazonBasics’ 1-year limited warranty. This means if the product is not suitable, if your cat doesn’t take to it, or there are manufacturing defects, you can safely return it and get your money back. The next pet carrier featured is the premium pet carrier by Petpreppy. This is an expandable carrier which is also airline approved. We will take a look at its special features below. Petpreppy offers a durable and safe pet carrier which is available to take your cat almost anywhere with you. Let’s face it, if your pet is to travel in a small carrier, it has to be good quality. The Petpreppy carrier is made with great quality, eco-friendly materials, which result in a durable and comfortable pet carrier, guaranteed to please your pet for may journeys to come. Convenience is necessary in a pet carrier and with Petpreppy, you certainly get it. Thanks to a double expandable entry design, the pet carrier can easily be accessed from either side, and gives a bit more room to your pet should they require it. This dual expansion also makes the carrier super easy to fold up and store. When people take pets onboard, their biggest fear is having a carrier that isn’t suitable for the seat dimensions. The Petpreppy carrier will give its users peace of mind knowing that it’s generous storage space makes it airline safe, allowing you to board with confidence with your pet. The third and final pet carrier on our list is the soft-sided pet carrier by X-Zone. 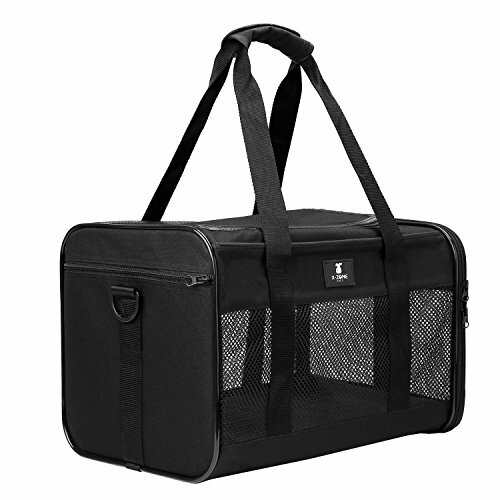 This pet carrier is perfect for airline travel and also features adjustable carrying handles for easy carrying. Looking for a quality pet carrier which is able to carry your pet comfortably? The X-Zone Pet Soft-Sided Carrier is perfect, with its airline-friendly design. When purchasing a pet carrier, you want to make sure it is strong enough to hold your pet with no chances of them falling out of it. The X-Zone is expertly crafted with durable Oxford fabric and strong mesh panels, which make it a great choice for your little pet to travel in. Another great feature of this carrier is that it has been made to fit within the airline safe measurements, meaning it is guaranteed suitably sized to be taken on flight without the risk of being too large. 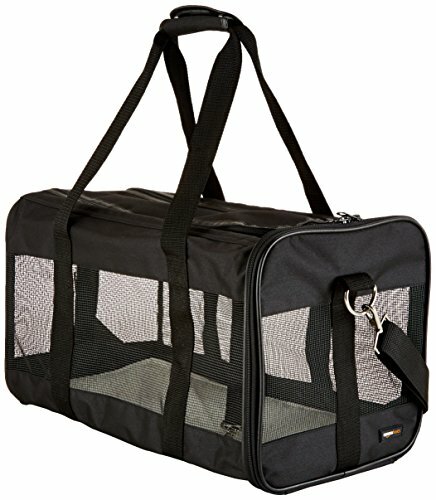 Which Cat Carrier Is Best For Me? The three pet carriers featured on our list are guaranteed to do a good job at carrying your pet safely and securely. If you are shopping on a budget however, perhaps you will be more interested in a less expensive option. The cheapest option is the X-Zone Pet carrier, which also comes in 2 different sizes. The second cheaper option is the AmazonBasics soft-sided pet carrier which is also a great quality carrier for the price. If you are looking for a quality pet carrier, we highly recommend any of the 3 mentioned on our list as they are capable of keeping your pet safe (and happy) during their travels.